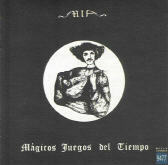 Mia "Magicos Fuegos del Tiempo"
The first album by this fine Argentine band. Even if you own this rare LP you need to have this CD reissue. First your copy is nearly unlistenable (thay all were!) and this has five bonus tracks that you don't have anyway! Notify me of updates to Mia "Magicos Fuegos del Tiempo"